Emenest has gone out its way to provide the best drinkware collection for you. Every single Emenest product undergoes extensive testing so you can rest assured that your glassware is durable, safe and ergonomic! Everything here is trusted and its value is not compromised. Have you been problematic in organizing your kitchen supplies like packets of sugar? Are you tired looking at your boring receptacles but don’t want to use low-quality bottles? 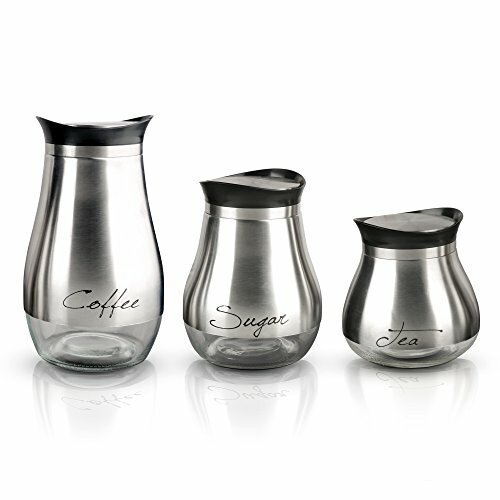 Cafe Silver and Glass Canister Set is an elegant and safe 3 food storage containers for coffee, tea, and sugar. This graceful 3-pc bulb shaped jar set is a perfect pair for your everyday meal. A fusion of vintage and contemporary style for a graceful serving on tabletops, in kitchen, hotel, restaurants, bars, cafes, party buffet. Its color harmonizes with your silverware that creates a decent ambiance in your space. In romantic fonts, containers are already labeled for easy identification of what content is inside each of them. Stores coffee beans, sugar, chocolate powder, tea bags, oatmeal, peanut, snack, dried beans, pasta and other dry goods. Made all-natural, sustainable raw materials, and 100% recyclable. Screw-on stainless steel cover to keep your food safe and fresh. The perfect gift set for any housewife, the Emenest 3-piece Cafe Silver Container are best for weddings, anniversaries, birthdays, housewarmings, Christmas or any holiday seasons. KITCHENWARE SET - 3 classy pieces of dry good storage in a clear glass body with an ultra stylish silver finish and airtight stainless steel seal. In romantic fonts, containers are already labeled for easy identification of what content is inside each of them. Its near-bottom is also see-through for a quick glance. Each bulb shaped canister is of various size - 51-ounce coffee, 29-ounce tea, and 34-ounce sugar. VERSATILE - A perfect blend of finesse and versatility. Looks sophisticated on any tabletop, in kitchen, hotel, restaurants, bars, cafes, party buffet. Designed for multi-functionality - keeps coffee beans, tea bags, creamers, chocolate powder, sugar, and other kitchen essentials dry and fresh. Not only it satisfies your quench for morning beverages, it also can store your breakfast ingredients like crackers, oatmeal, grains or nuts. AESTHETIC APPEAL - Elevate your everyday drinking experience as you place every bottle next to the other along with your relaxing beverages. A fusion of vintage and contemporary style that is neat and beautiful. Specially built in varying heights to complement the amount needed when stashing your dining staples. Its color harmonizes with your silverware that creates a decent ambiance in your space. It makes an attractive decor at home or any special events, also a lovely gift favor. HIGH-GRADE PACKAGING - Constructed from top quality materials. Scratch and shatter resistant, a glass with impressive durability, stability and lasting appeal. Non-porous glass jars will prevent your liquid or solid food items from getting squishy or absorbing odors. It also keeps insects, bugs, and dirt out of the tin. The lid is made of plastic for a fingerprint resistant. Wide mouth for easy filling and refilling. HEALTHY AND ECO-FRIENDLY - Strongly recommended by health experts: regarded as safe by the U.S. Food & Drug Administration. The glasses do not contain any harmful chemicals such as BPA, phthalate, PVC, or polycarbonate, so nothing can leach into your beverage from the glass. Made all-natural, sustainable raw materials, and 100% recyclable. Easy to wash, clean and sterilize for the next use. View More In Food Bins & Canisters. If you have any questions about this product by Emenest, contact us by completing and submitting the form below. If you are looking for a specif part number, please include it with your message.